The Jinhua pig of Zhejiang Province in China, is characterized by its hair color and meat quality. The animals have a white body, with black at the head and rump. This leads to the common name of "two-end-black". The back and loins are slightly curved. The breed is especially noted for its thin skin, fine bones and tender meat. After special processing, "Jinhua ham" is favored for its attractive flavor and rosy color and it has a high reputation in the international market. Jinhua belong to a type of swine found in central China, the region between the Changjiang and Zhujiang rivers where the climate is temperate (or warm) and moist. Agriculture in this region is highly developed and the main crop is paddy rice. The area is rich in feed and especially abundant in green and water plants which are used as pig feeds. Pigs in this region are generally penned and well managed. 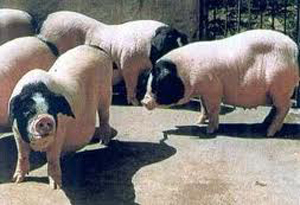 Jinhua pigs are early maturing and may be mated as early as 3 to 4 months old. They are fairly prolific with an average litter size of 13 and seven pairs of teats.